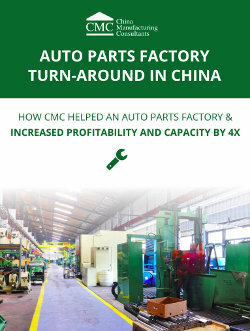 CMC's consultants have many decades of cumulative experience of managing and fixing factories. We don't only share this knowledge on the factory floor though. 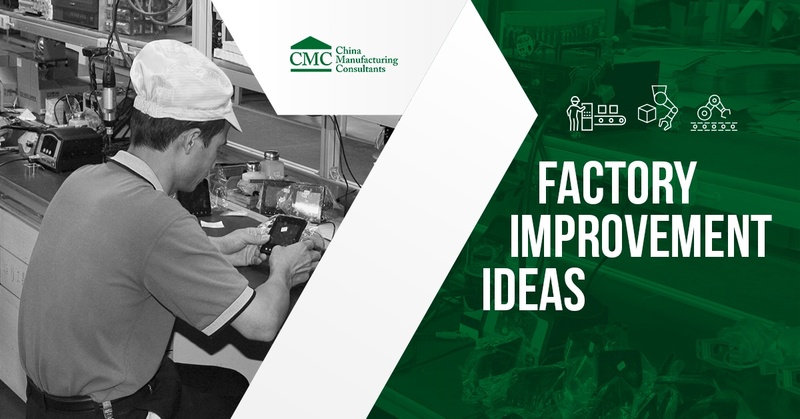 For the past few years, we've been producing free China manufacturing improvement blog posts and webinars, presentations, and eBooks covering all kinds of factory improvement ideas. In this blog post I'm going to share some of the most popular CMC resources that you may have missed, and explain their benefits. Who can benefit from our consultants' factory improvement advice? 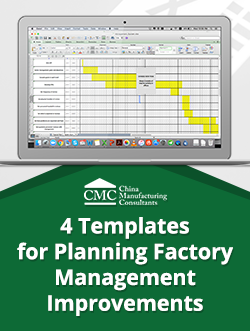 Learn how our consultants tackle factory improvements and use these techniques (built into ready-made excel spreadsheets for you) to make improvements to your own factory. How to set up a management system that aligns everyone's goals and objectives for faster improvements and better results. Setting up good process controls to ensure products are of high quality. Creating a production planning system that is adapted to your unique manufacturing activity, in Excel and then in an ERP system. A solid project management system for factories that make highly-engineered products (custom-built for each project). would be of great benefit, but which mistake-proofing techniques are recommended? If you're already using these, great! 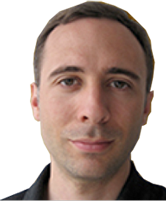 However, if not, consider whether if by implementing them you would be able to eliminate some common quality issues. There's really nothing to lose, as we have purposefully selected low or no-cost options. A lack of manufacturing management training can cause a number of fairly serious issues in Chinese factories. 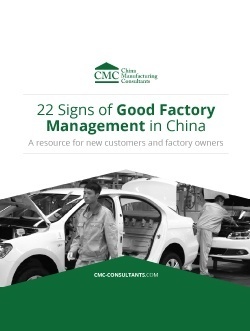 This presentation outlines 22 signs that a factory is well-managed. If any of these 'signs' raise a red flag, then you can make targeting them a priority. 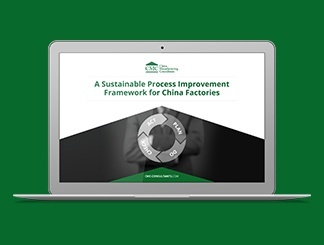 We created this resource to lift the lid on the 11 step process improvement framework that our manufacturing consultants use when working with a factory. 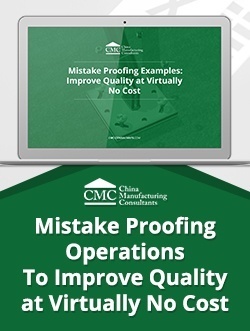 If your factory has issues with cost, quality, delivery, or any combination of the three, then you should use this framework as a starting point for your own improvement activities. Not only does it include a PDF version of the framework, but you'll also see a video where I talk you through this tried-and-tested approach as soon as you complete the request form. What if you could assess your factory's strength's and weaknesses right now, with an easy-to-use online tool that only takes a few moments to fill out? 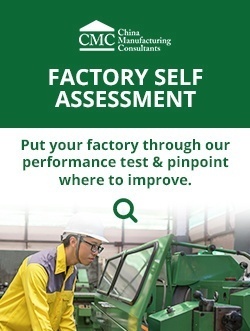 By answering 5 questions about each of these topics in relation to your factory, our system will then generate an assessment of how well you're currently performing, and offer you bespoke advice from our manufacturing consultants tailored to your unique situation as outlined in the answers you gave. Ready to take the assessment? It's like a free consultation with manufacturing consultants! 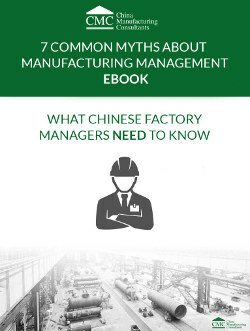 In this eBook we dispel some common manufacturing management myths, with a special focus on China. Our experienced consultants have pooled their experience in order to help you improve your factory management style in 2018 and beyond. 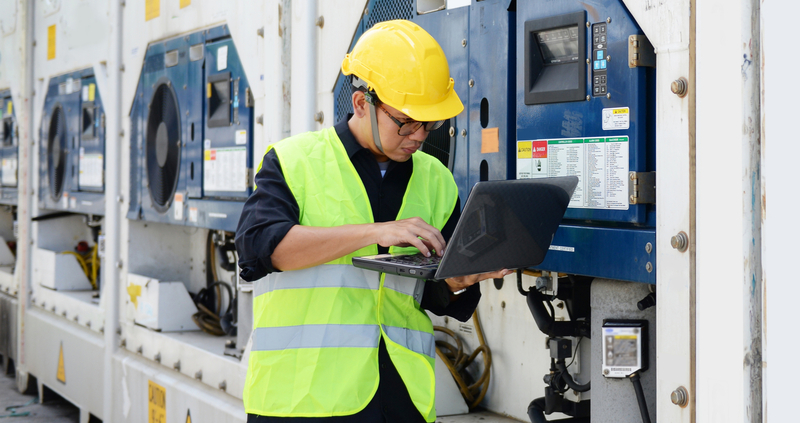 If you've previously subscribed to any of these ideas, then hopefully this eBook will show you a different, better, option which can help improve your factory processes moving forward. Seeing 'real-world' examples of how our manufacturing consultants have helped factories in China to make positive, lasting changes can also serve as inspiration and guidance to you. We did it by eliminating bottlenecks, and implementing production planning and preventive maintenance plans. Which of these topics did you find most useful for your business? Don't forget that there are more factory improvement ideas like these to be found in our resources library. If you have any questions, or requests for blog posts or eBooks on a topic that we haven't covered, please ask me by leaving a comment below! Need help to fix your factory in China right now? No problem, our China manufacturing consultants are here to assist you to make positive and long-lasting changes. Get started by having a no-strings discussion with us about your current situation and goals. We'd love to find out more, so just hit the orange button below to schedule a call when convenient for you! 10 years experience in China. Audited and/or consulted for hundreds of factories in China. Author of well-read blog, Quality Inspection Tips.